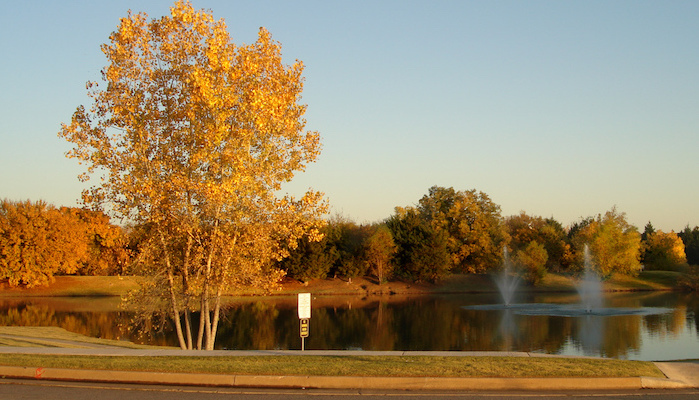 The city of Edmond, just north of Oklahoma City, has several popular running areas that are easily accessible from OKC. Mitch Park: One of the top spots in this area is Mitch Park, a sprawling 280 acre park with recreation opportunities from disc golf to an exercise station. There are 5 miles of paved multi-use paths throughout the park, including a main loop trail of about 2.8 miles. MAP. Eagle Trail: Looping around the campus of Oklahoma Christian University, the Eagle Trail is a 2.5 mile path on a combination of asphalt and crushed rock. The green spacious campus offers plenty of parking and a nice car-free route. There is also lighting and security phones along the path, which makes it a great spot for an evening run. In the northwest corner, the trail connects to the Margeret Annis Boys Centenial Arboretum. These beautiful gardens are walking-only, but it’s a nice place to do a cool down lap after your run. MAP. Sooner Road: Edmond is known for its hills (or at least hills by flat Oklahoma City standards!). Sooner Road is the favorite for a rolling hill course. There is no sidewalk or shoulder, but most cars use nearby Rt. 77 for any high speed north-south travel. The road is about 12 miles total, but most runners start at the Petroleum Center and do an out and back to the north. MAP. Arcadia: Arcadia is a small town within the Edmond limits, and another great spot to find some hills. Most of them can be found surrounding Arcadia Lake and Spring Creek Park. Douglas Boulevard, stretching 10 miles north from the lake before it turns to dirt, is a favorite. MAP.